Creamy sweet potato tomato sauce, with tender sprouted and slow-cooked chickpeas; over a bed of rice and sprinkled with fresh herbs. The sauce is extremely flavorful and filled with spices such as ginger, coriander, cumin, fenugreek, garlic, onion, paprika, cayenne, and more! 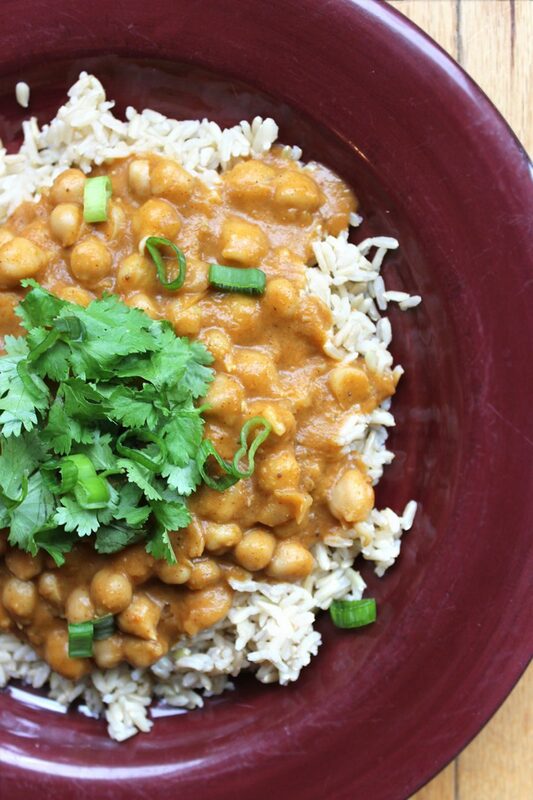 Chana masala is a classic chickpea dish in a creamy tomato sauce, and there are thousands of different recipe variations. 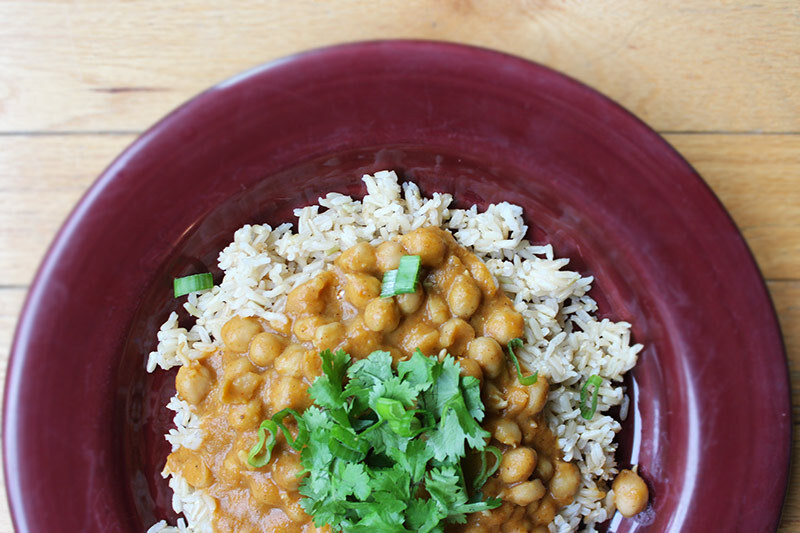 My favorite version is with sprouted chickpeas, and the addition of sweet potato and a few extra spices and herbs. 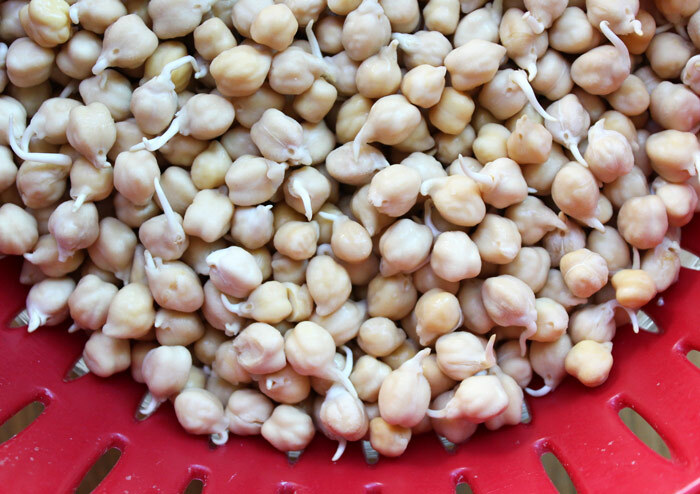 Soaking and sprouting chickpeas is an excellent way to remove anti-nutrients. Anti-nutrients can make legumes harder to digest, especially for those with weaker digestive systems, it can also cause uncomfortable bloat and gas. All you have to do is soak the chickpeas in water overnight, rinse and drain them in a strainer, put the strainer over the bowl to collect the drip water and continue to rinse twice a day for the next 24-48 hours or until they start to sprout little tails. 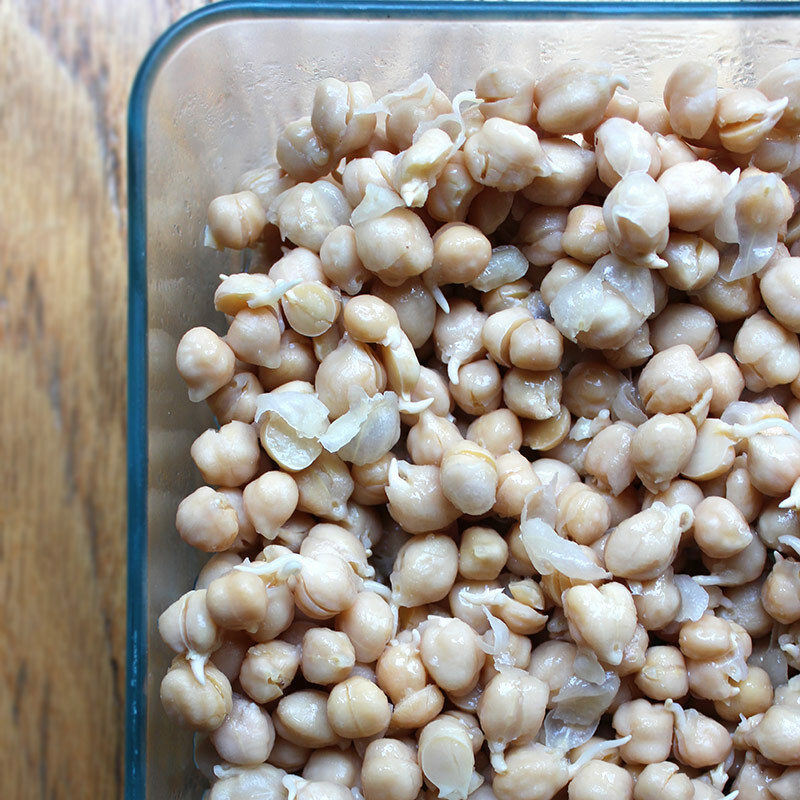 Soaking and sprouting also reduces the cooking time and results in a very tender chickpea. In this recipe I show you how to make 1 quart of sauce and 1 quart of chickpeas. Usually when I make chickpeas, I make 2 quarts and jar them so I can use them for multiple dishes over the course of the month. I put them in the slow cooker with a lid, you could use a saucepan, with a little bit more water than needed to cover them, on low for about 4 hours or until they are nice and soft. Then I pour the hot chickpeas in a sterilized, or dishwasher washed, quart mason jar and put a metal band and lid on immediately. The lid will get suctioned on as it cools to room temperature. Once cooled you can store the jars in the fridge for a month or two and heat them up in the sauce when ready to eat. If you’re pressed for time, the other method is to cook the chickpeas with all of the sauce ingredients in a slow cooker. The only problem, you won’t be able to blend the sauce, you’ll have a chunky stew like sauce which may not necessarily be a bad thing. The spices and herbs play a huge role in this particular dish. Usually the spices are sizzled in oil on low for about 20 seconds or until they become ultra fragrant. Then you add in the rest of the ingredients. However, if you are slow cooking the entire dish, you can just add all the sauce ingredients at once; the flavors from the spices will still be there. Slightly cooking the spices does provide extra depth in flavor, but only if your palette is super refined. I like the idea that my spices are staying more intact and infusing rather than frying in oil and oxidizing, that could just be me though ;). If you read the benefits of any spice or herb you’ll see a wide array of health benefits, keeping them intact as much as possible is usually my goal. Try to buy all spices fresh or whole from the bulk bins, avoiding powders to avoid oxidized spices which normally lack in flavor. 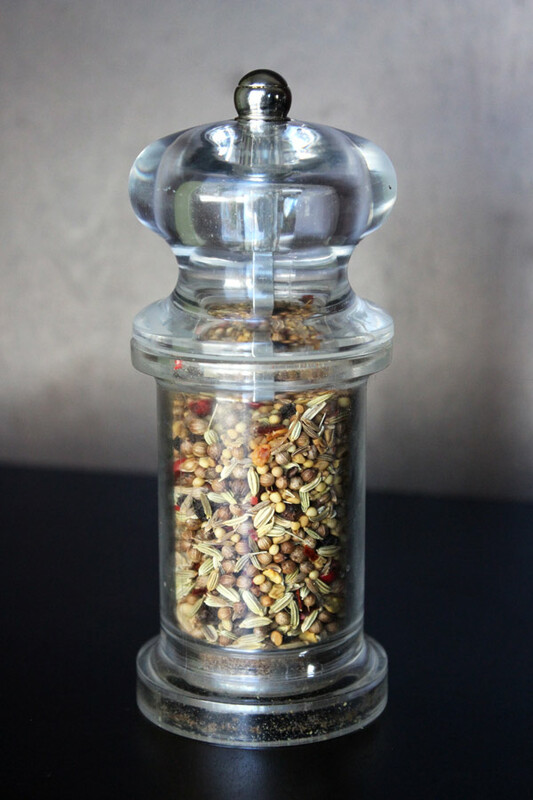 If I need a powdered spice I usually put it in a spice grinder or an old hand-held pepper grinder like the one below, that way it’s fresher. This one has fennel, mustard seed, coriander, cumin, fenugreek and peppercorn. Other fresh spices include cayenne or another hot pepper, ginger, turmeric, garlic, onion, garam masala powder and paprika powder. Of course any of these that you can’t find fresh can be substituted with dried and/or powdered version. Don’t cook the herbs, because fresh green leafy herbs are delicate, they will be cut fresh and sprinkled over the completed dish to preserve flavor and nutrients. I like using cilantro, fennel and scallions, but any herb you like will do! 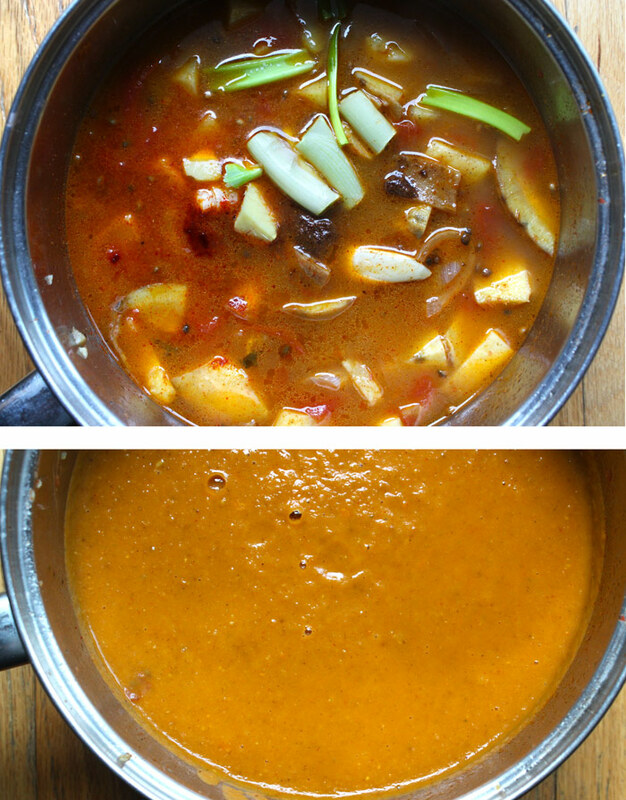 Usually to thicken up the sauce, canned coconut cream is used, and sometimes a thickener like arrowroot powder. Don’t get me wrong I love the versions with coconut cream, but I try to avoid using canned foods for several reasons. Instead I replace olive oil with coconut oil, and use water and or coconut milk as the liquid/fat portion. Side note, I never cook with olive oil because it is a delicate oil and is destroyed with minimal heat; coconut oil is good for high heat and it gives us that fatty coconut taste and texture, plus I always have it on hand for a million other things. If the flavor of olive oil is preferred I usually drizzle a tiny bit of fresh olive oil on top. Sweet potato is the greatest natural thickener. Cornstarch, arrow root or other similar powders are used because the starches emulsify the sauce. But you don’t have to use a white powder to get that effect, you can use a potato! Sweet potatoes or yams are my favorite because they add a sweetness to the sauce that is so delicious and irresistible! There are many many techniques that you can use to create a sauce, it all depends on the tools and time you have. If you work for 8 hours a day and want a meal to come home to, I would use the slow cooker. Just add in all the ingredients to the slow cooker in the morning, turn it on low and let it cook all day. When you get home let it cool, blend it up and you’re sauce is good to go. Now you just have to throw the rice in the rice cooker and add the already cooked chickpeas to the sauce and let it warm up. This is my flow; The chickpeas were already cooked and canned as I mentioned above. I start the rice in the rice cooker, then I prep all of my ingredients; get the spices measured out in a ramekin, peel the garlic, slice the onion, ginger, and fennel, and lastly cube the tomatoes and sweet potatoes. Next, I throw a sauce pan on medium low, put 2 tbsp coconut oil in, add in the spices, let them cook for 30 seconds at most. Add in the coconut milk or water, let it come to a boil then turn down the heat to low and add in the rest of sauce ingredients. Let it all simmer for about 20 minutes or until the sweet potatoes are soft. Once the potatoes are soft, let it cool a bit, so you can blend. Add the sauce back to the sauce pan, put it back on low, add in the chickpeas, and put a lid on it for about 5-10 minutes. A little chickpea juice won’t hurt, I don’t bother to rinse and strain my homemade chickpeas. The sauce, chickpeas, and rice should all be done at the same time; within 30 minutes. 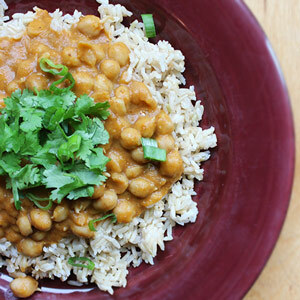 I enjoy an even ration 1:1 of sauce & chickpea to rice, with about a 1/4 cup of fresh herbs. Other times I enjoy 2:1 with more sauce, and some people enjoy 1:2, you decide. I hope you enjoy this twist on and Indian classic! a creamy flavorful sweet potato tomato sauce with sprouted and slowed cooked beans, over a bed of rice, and sprinkled with fresh herbs. Rinse and drain twice a day for 1-2 days until little tails sprout. Slow cook chickpeas on low for 4 hours in enough water to cover them. You can also sprinkle in a bit of salt. Cook brown rice in rice cooker with water an inch above rice. Add all of the sauce ingredients to a sauce pan, let it all come to a boil, then turn down the heat to low and let simmer for about 20-30 minutes or until the sweet potatoes are soft. Let it cool enough to blend down into a smooth sauce. Put the sauce back into the sauce pan, add the chickpeas in, and warm up on low for a few minutes. Pu about a cup of rice and a cup of sauce and chickpeas on a plate with about 1/8 cup fresh herbs sprinkled on top. Store rice separate from chickpeas and sauce, both in airtight containers in the fridge. Store for up to 2 days. Pingback: Plant Based Diet Meal Plan for Beginners: 21-Day Kickstart Guide!